Call Today to Get a Quote! This Wi-Fi operated garage door opener can be controlled from your smartphone. It comes equipped with Security+ 2.0® technology, MyQ® technology, battery backup and a timer-to-close feature. 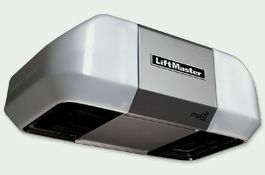 The LiftMaster Elite Series Model 8500’s innovative design allows it to be mounted on the wall beside your garage door to free up ceiling space. Model 8500 comes equipped with Security+ 2.0® technology and features a “timer-to-close” option that will close your garage door automatically after a pre-programmed number of minutes. 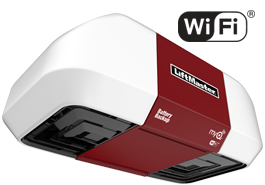 The model Liftmaster 8550W door operator is manufactured by the Chamberlain Group. It will operate the garage door opener for 40 cycles within a 24-hour period, and recharges automatically when the power comes back on; an audible signal tells you when the power is out and the EverCharge® Standby Power System is in use. Meets all UL325 requirements. After the power goes out, the standby power system will operate the garage door opener for 40 cycles within a 24-hour period. The model Liftmaster 8500 door operator is manufactured by the Chamberlain Group. If you want the extra storage space up above, have an oversized garage door, or even a cathedral ceiling, the LiftMaster® model 8500 Residential Jackshaft Opener is the perfectly engineered solution to fit your specific garage door opener requirements. It mounts easily on the wall beside the garage door, and comes with a remote 200-watt light that can be positioned anywhere in the garage. The optional EverCharge® Standby Power System – that continues to operate your opener even when the power goes out – makes it even more convenient. Meets all UL325 requirements. 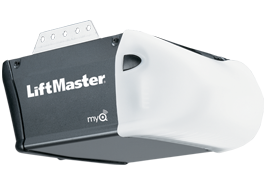 Equipped with MyQ® technology, the included MyQ® Control Panel when paired with the LiftMaster® Internet Gateway allows you to close your garage door or turn lights on or off using a smartphone or computer – from anywhere in the world. Specially designed for garages and unique applications that don’t allow for a traditional garage door opener, such as garages with very low, cathedral or obstructed ceiling. Power Lock - once the garage door goes down, it's securely locked with the power lock, which is similar to a deadbolt and ensures the door cannot be forced open. After the power goes out, the standby power system will operate the garage door opener for 20 full cycles within a 24-hour period. Put power right where you need it with our Alternate Power System. Added flexibility makes installing easier, bringing electricity to the opener, so there’s no need for an electrician. UL approved. Allows operator to be mounted below the torsion bar. Our basic single-button remote control isn't so basic. It can operate a single garage door or gate, or turn your garage door opener lights on/off. You can also use it as an extra remote control to turn on lights or small appliances inside your home – all from the comfort of your car. Our basic 3-button remote control isn't so basic. It can operate up to 3 garage doors or gates, and/or turn your garage door opener lights on/off. You can also use it as an extra remote control to turn on lights or small appliances inside your home – all from the comfort of your car. Access your garage and home without the use of a key or a remote control. The LiftMaster® Security+2.0 Wireless Keyless Entry can open your garage door using a code that you program directly into the unit. There is also a temporary password option that enables family, friends, or service people to enter the garage/your home without giving them your personal code. Backlit keypad which makes numbers easy to see, even in the dark. Are you always on the go? Our mini 3-button remote control is a miniature version of our 3-button remote control, and just as powerful. It can open and close 3 garage doors or gates, turn opener lights on/off, and/or turn on lights and small appliances in your home. And the best part is that it can fit almost anywhere – in your purse, your pocket, or even on your keychain.Get control on the go. 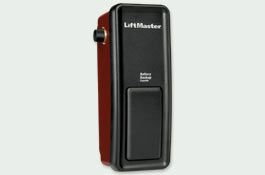 The model Liftmaster 8355 door operator is manufactured by the Chamberlain Group. The 8355 1/2 HP Belt Drive Garage Door Opener is the perfect choice if you want both quiet and smooth-running reliability, or simply have rooms positioned above your garage. The 1/2 HP heavy-duty motor is equipped with the patented Motor Vibration Isolation System (MVIS®) that eliminates powerhead vibration for reduced noise. As more convenient features, this operator also is equipped with built-in MyQ technology that lets you monitor and control your garage door and house lights remotely by using a computer or smartphone with the available LiftMaster Internet Gateway. Meets all UL325 requirements.